New Shipping Terminal in Hamilton, Bermuda. Modification to the Cruise-ship docking facility on Heritage Wharf on Ireland Island, Bermuda Ireland Island is just a short ferry ride from Hamilton, Bermuda and is where large cruise ships dock in order to route tourist traffic while preserving the quaint view of the island of Bermuda. Modification to the shipping terminal, Heritage Wharf is currently underway at Ireland Island's, Royal Naval Dockyard in Bermuda to serve Norwegian Cruise Line's new ship, Breakaway cruise ship. The modifications will also address an unsteady seawall at the berth. 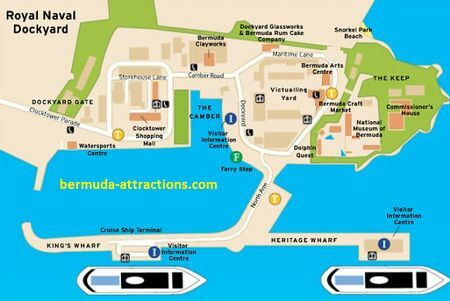 Currently there are two wharfs at the Royal Naval Dockyard that serve the large cruise ships, Kings Wharf and Heritage Wharf. Kings Wharf, the larger of the two is located in Sandys Parish at the western end of Ireland Island and is the original berth in Bermuda; it is where the majority of the contracted cruise lines dock their ships in Bermuda. The second berth Heritage Wharf is located on the eastern end and was built in 2009 to allow two large cruise ships to dock at the port at the same time. The charm of Bermuda offers a great attraction to those seeking a large-ship voyage destination, but, the mouth of Hamilton Harbour nor the dock facilities in town can accommodate those larger vessels. As a result, cruise ships once based at Hamilton, Bermuda's capital now must go to Wharfs at the Royal Navy Dockyard. But by no means does that mean one must bypass Hamilton; it's an easy ferry ride from the Dockyards. The Dockyard once served as an outpost for the British Royal Navy, and has come a long way to become the busiest passenger ship port in the island. Norwalk Marine Contractors, Inc. is proud to be the prime subcontractor for the Royal Naval Dockyard Cruise Ship Terminal in Bermuda. We were chosen for our experience and knowledge in this type of project:" -- Skip Gardella, President and Founder of Norwalk Marine Contractors, Inc. Norwalk Marine Contractors, Inc. has expanded since its inception in 1985 from a local marine contractor for private and commercial coastal projects to providing specialty foundations and solutions. 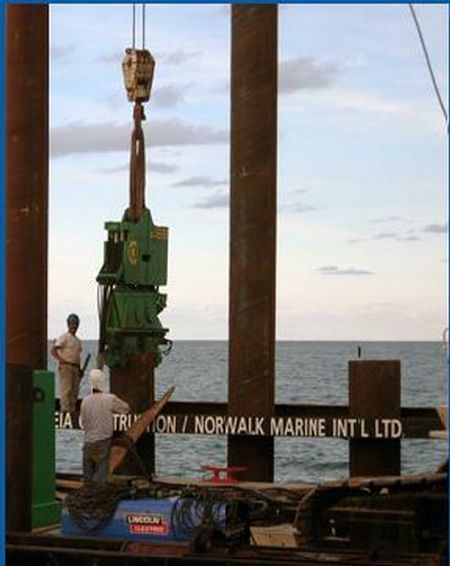 "Norwalk Marine International, LTD is one of the most diverse pile driving companies throughout Connecticut, New York, and New England. 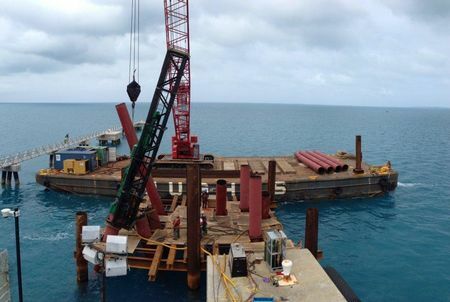 NMC's reputation as a progressive, full-service provider for marine construction, pile driving, and deep foundations for over 20 years has brought them regional as well as international recognition. Their projects range from along the rugged Northeast corridor down to Bermuda's crystal waters. Their latest project involves the construction of two new moorings and two new berthing dolphins for the new Breakaway Class Cruise-ship line in Bermuda. 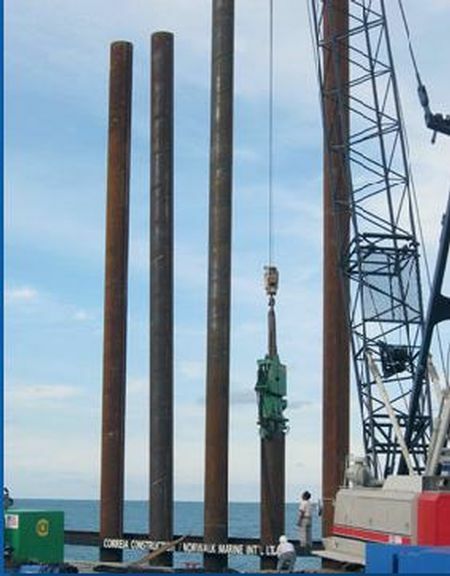 They are initially vibrating 36"piles using offshore leads to set the piles. They are performing a static and dynamic load test in both compression and tension to a load of 275 tons. Each breasting dolphin comprises of 16 piles. The mooring dolphins are comprised of 12 piles. Dolphins are generally divided into two types, namely breasting dolphins and mooring dolphins. Breasting dolphins assist in berthing of vessels by taking up some berthing loads; keep the vessel from pressing against the pier structure; and serve as mooring points to restrict the longitudinal movement of the berthing vessel. Mooring dolphins, as the name implies, are used for mooring only and for securing the vessels by using ropes. They are also commonly used near pier structures to control the transverse movement of berthing vessels. 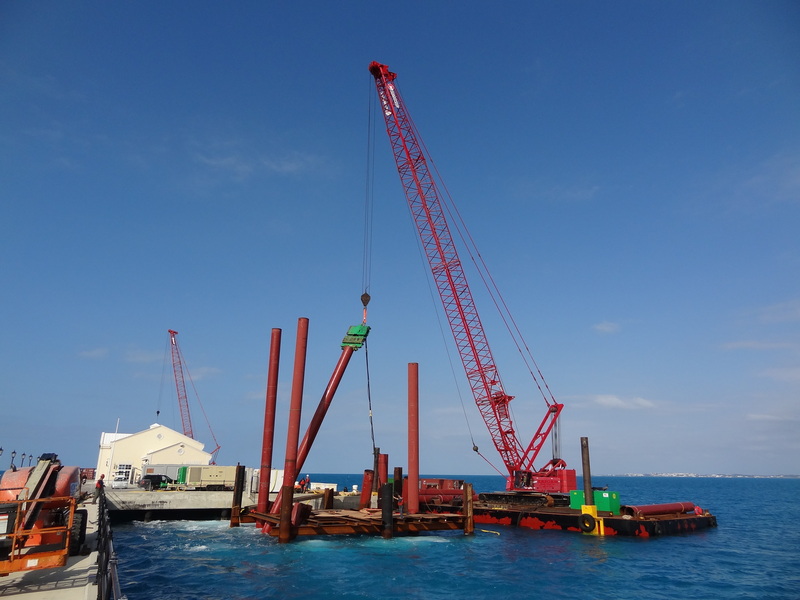 "Norwalk Marine International installed 36"x.750" caissons for the foundation of the moorings and dolphins. The biggest challenge for the job, according to NMI, was that some of the piles had to be driven on a 3 on 1 batter. The piles were first installed into position with an ICE? model 50B vibratory driver/extractor. Then they were driven to capacity with an ICE? model I-46 in 42" offshore leads with special rigging to allow the off shore set-up to be picked and positioned on the required 3 on 1 batter. 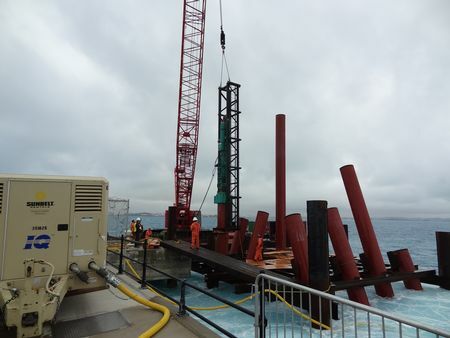 Two I-62 diesel hammers in 42" off shore leads as well are also used to increase capacity. This six-month project expected to be finished by mid-2013 for the arrival of Norwegian Cruise Line's new, 4,000-passenger Norwegian Breakaway -- the largest cruise ship ever to regularly sail to the destination.